Aspire is a team of private professionals who operate a transparent pricing policy. We understand the pressures of divorce and make sure that you are in charge, with our experienced mediators to guide you. When you are considering a settlement for your divorce you will probably find that there are some disputes. This is a completely normal part of the process but with legal fees the cost of a divorce can soon mount up. The costs of a divorce have been estimated at over twenty thousand pounds if you proceed through a court. For many people, this is greater than an annual salary, and it can have a long term impact on your financial future. In comparison, the first meeting with one of our mediators costs less than one hundred pound, including VAT. We can also offset the cost of this meeting against your future legal costs if you decide to invest in one of our legal packages. Unlike with legal fees, there are no hidden costs associated with our mediation services. You will be charged for each hour that you spend with the mediator at a highly competitive rate. The beauty of mediation is its flexibility. It is an open-ended process where you are in control of the number of meetings and the final outcome. You can even decide to end the process at any time if you do not wish to continue with mediation. There is really no excuse for trying mediation, and courts specify that individuals should have attended Mediation Information and Assessment Meetings in most cases. Aspire is a team of private professionals who operate a transparent pricing policy. Although we do not operate public mediation, we do charge highly competitive prices that will not eat into your budget. 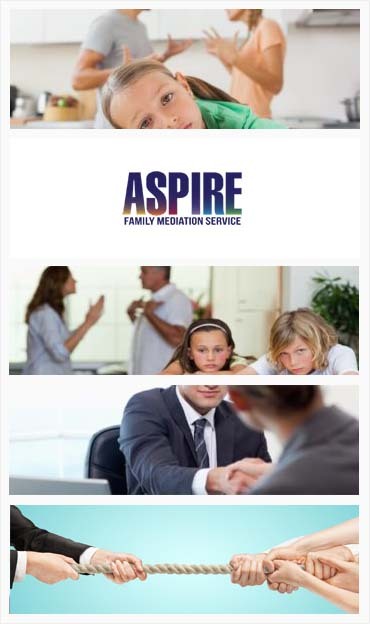 We understand the pressures of divorce and make sure that you are in charge, with our experienced mediators to guide you.